December 5, 2013 (Tony Cartalucci) - Already holding by far the worst human rights record in Thai history, the Shinawatra regime has just been exposed for its role in allowing organized human trafficking of Rohingya refugees to take place via its own immigration department and police. Worst of all, it appears the regime's police may even be profiting from it. Image: Forsaken - Rohingya refugees have been butchered and forced to flee Myanmar by the US-backed "saffron monks" of so-called democracy icon Aung San Suu Kyi, only to end up in slave camps courtesy of the US-backed Shinawatra regime in Thailand. Unwanted refugees, instead of being sent back to their country of origin, are instead sold into slavery, held hostage for ransom, or brutally murdered in gulag-like camps along the Thai-Myanmar border, reports Reuters. As thousands of Rohingya flee Myanmar to escape religious persecution, a Reuters investigation in three countries has uncovered a clandestine policy to remove Rohingya refugees from Thailand's immigration detention centers and deliver them to human traffickers waiting at sea. 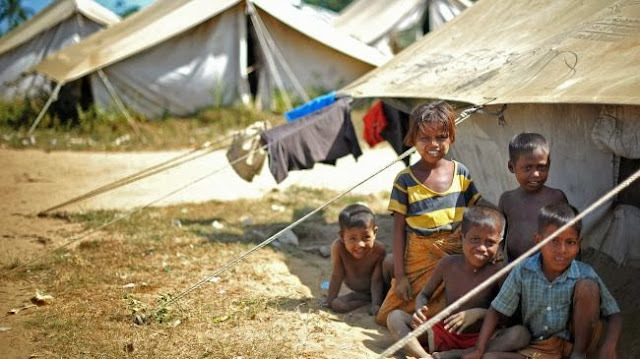 The Rohingya are then transported across southern Thailand and held hostage in a series of camps hidden near the border with Malaysia until relatives pay thousands of dollars to release them. Reporters located three such camps - two based on the testimony of Rohingya held there, and a third by trekking to the site, heavily guarded, near a village called Baan Klong Tor. The very police facing down anti-regime protesters in Bangkok, admit they are fully aware of the ongoing atrocity, displaying depraved apathy and even hinting that they have profited from the slave camps. Presented with the findings of this report, Thailand's second-highest-ranking policeman made some startling admissions. Thai officials might have profited from Rohingya smuggling in the past, said Police Maj-Gen Chatchawal Suksomjit, Deputy Commissioner General of the Royal Thai Police. He also confirmed the existence of illegal camps in southern Thailand, which he called "holding bays". Tarit Pengdith, chief of the Department of Special Investigation, Thailand's equivalent of the U.S. FBI, was also asked about the camps Reuters discovered. "We have heard about these camps in southern Thailand," he said, "but we are not investigating this issue." Tarit Pengdith, of the Department of Special Investigations (DSI) admits he is aware of the camps but cannot be bothered to investigate what is by all measures an ongoing crime against humanity occurring within his jurisdiction. This is because Tarit is instead pursuing a myriad of politically motivated cases against the enemies of Thaksin Shinawatra, the regime's defacto leader. Curiously, while Reuters exposes what is essentially a dysfunctional, corrupt regime indifferent to the rule of law, human suffering, or even simple human decency, it, along with the rest of the Western media continues to portray the Shinawatra regime as the legitimate, "democratically elected government" of Thailand, claiming anti-regime protesters are instead irrational, "anti-democratic" and "elitists." The dismal human rights record of the Shinawatra regime is rarely mentioned in the Western media these days, as the West attempts to bolster it in the face of persistent anti-regime protests. However, many may be shocked to find it guilty of grotesque acts of injustice, mass murderer, intimidation, in addition to the charges of human trafficking being leveled against it now. During Thaksin’s first term (January 2001 -- January 2005), eighteen human rights defenders were assassinated and one was disappeared. Although arrests have been made for some of the murders, many of the cases remain unresolved. 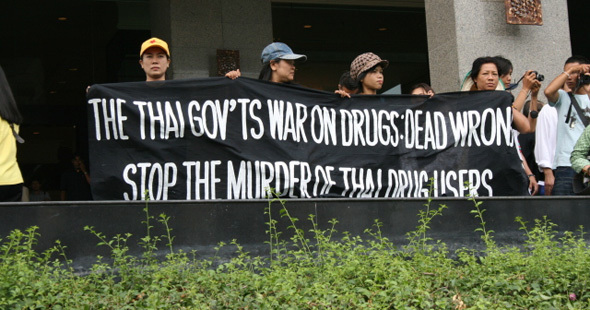 In 2003, starting in February and over the course of 3 months, some 2,800 people (approximately 30 a day) would be extra-judicially murdered in the cities and countrysides of Thailand as part of Thaksin's "War on Drugs." The following year would see the Tak Bai incident which involved 85 protesters killed in a single day in Thailand's deep south. And despite Thaksin's atrocious human rights record, by far the worst in Thai history, and even challenging regional lows, the West continued to support his regime. Populist Prime Minister Thaksin Shinawatra's press freedom record has been less than stellar since he took office in 2001. His political and financial interference, legal intimidation, and coercion continued to have a chilling effect on critical voices in the Thai press in 2004. Critics accuse Thaksin and his administration of creeping authoritarianism, cronyism, and blurring the lines between business interests and politics. Local journalists told CPJ they routinely receive phone calls from government officials trying to influence editorials and reporting. They said Thaksin's powerful government and his allies often threaten to withdraw advertising from publications in retaliation for negative articles. As a result, local journalists said, self-censorship has increased dramatically during the last four years. The decision of executives at the Bangkok Post to remove Veera Prateepchaikul, editor of the influential English-language daily, is a direct example of such interference, local sources said. His reassignment in February stunned and outraged the local press and was a major blow to the Bangkok Post staff, which sent a letter of protest to management. Veera, who goes by his first name, is also president of Thailand's journalists' union, the Thai Journalists Association. Veera Prateepchaikul continues to this day to speak out against the Shinawatra regime with his recent, and very cogent critique of the current regime headed by Thaksin's nepotist-appointed sister, Yingluck Shinawatra, titled, "Yingluck can't duck responsibility for protest fatalities." In it, he calls on the regime's proxy, Yingluck, to step down after violence triggered by regime militants claimed the lives of now 5 people. The ruling party and its allies and supporters now control a significant chunk of Thailand's television and radio media, either directly or indirectly, say analysts. The article describes how members of Thaksin's regime were systematically buying out media interests even while holding office. This obvious conflict of interest was compounded by suits the regime brought against news editors for "libel" - merely censorship by lawsuit. It is very clear to see why Thais have amassed in the streets calling for the complete "uprooting" of the Shinawatra regime. From human rights, to freedom of the press, to the immense corruption, incompetence, and wrecking ball abandon exhibited by the regime, its removal is a matter of survival for Thailand. What is perhaps more difficult for some to understand, is why the West continues to portray such a regime as "democratically elected," "legitimate," and its detractors as being the source of the current crisis.